It seems like every year, Black Friday starts earlier. 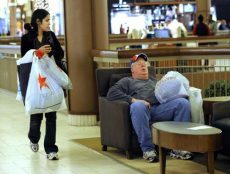 Last year, some retailers started moving it up a day, beginning their doorbuster sales on Thursday afternoon or evening. However, some are sticking to the old tradition of staying closed Thursday and opening at the crack of dawn on Friday. If you’re one of the many who will be eschewing sleep in order to get a great deal at four o’clock in the morning on Friday, you have to know that only getting a few hours of sleep on Thursday night could ruin your holiday weekend due to sleep deprivation if you don’t take some steps. If you MUST be up in the middle of the night, plan ahead. Try to get a little extra sleep for a couple of nights before the big event, to minimize the sleep debt. Plan to take it easy for the rest of the day. Once you get home, take a nap. Don’t wait until late in the day for that siesta, however, as it may keep you from sleeping well that night. Caffeine is your friend, but use it wisely. Having a cup of coffee while shopping or once you get home (or both) isn’t a big deal. However, don’t drink it the late afternoon or evening, as it may keep you up that night. Shop from home instead. Many online retailers offer free shipping through their websites, and you can shop without even leaving your bed. Remember, even if you get a lot of shopping done on Black Friday, there is still a lot of running around to be done to prepare for the end of the year holidays. Check out our Five Ways to Survive the Holiday Season Well-Rested to help make it a more enjoyable time of year.